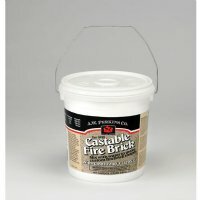 Make your own firebrick! When mixed with water, This cement sets to a light brown color, hard as brick. Use it for replacing worn-out firebrick in the bottom of woodstoves, cast it into irregular shapes, or use it as a solid stone bed. Originally developed for use in blast furnaces, this product has unbelievable strength. It can withstand temperatures up to 2200 degrees F. Sold in cases of two, each 1 gallon container covers one square foot at 1.5" depth when mixed with one quart of water. Easy directions are on each container.